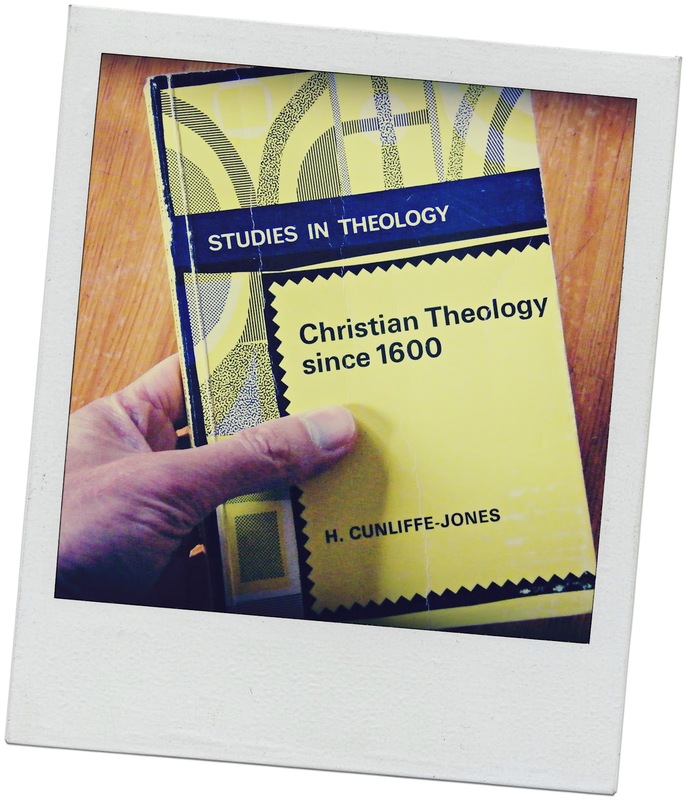 Book: H. Cunliffe-Jones. 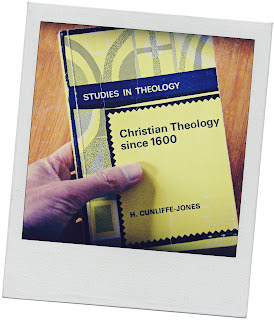 (1970) Christian Theology since 1600. 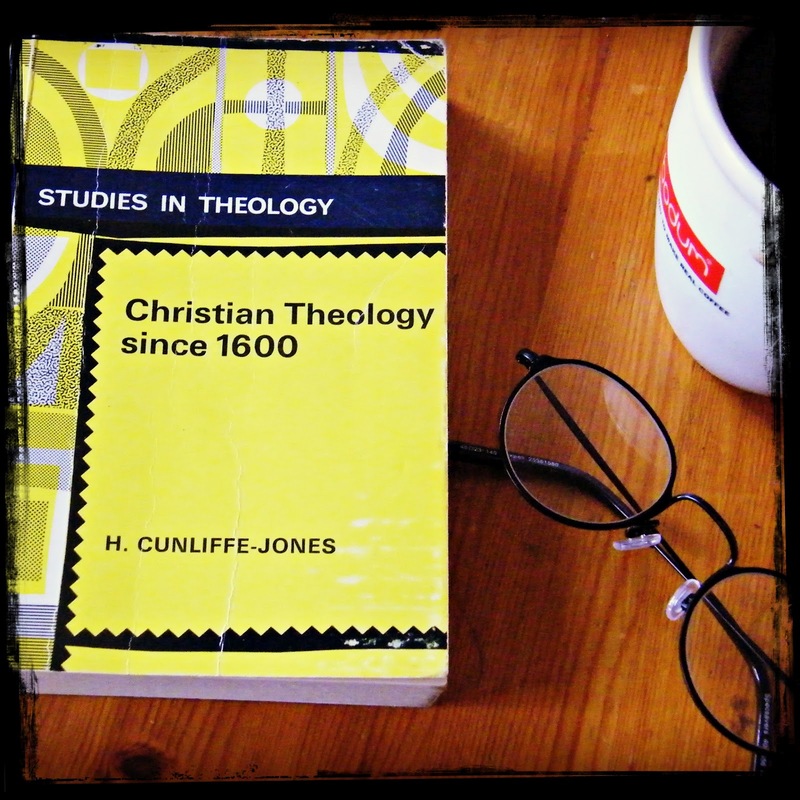 Studies in Theology. London: Gerald Duckworth & Co. Ltd.
Bought for £1 in G. David (Bookshop), St. Edward's Passage, Cambridge in 1991. Bright citrus-yellow, thin, cardboard cover that somehow reminds me of the lids off old Jigsaw boxes. Compact feel, that whispers (siren-like) how good it would be to slip it into one's coat pocket for those idle 20 minutes in a coffee shop. 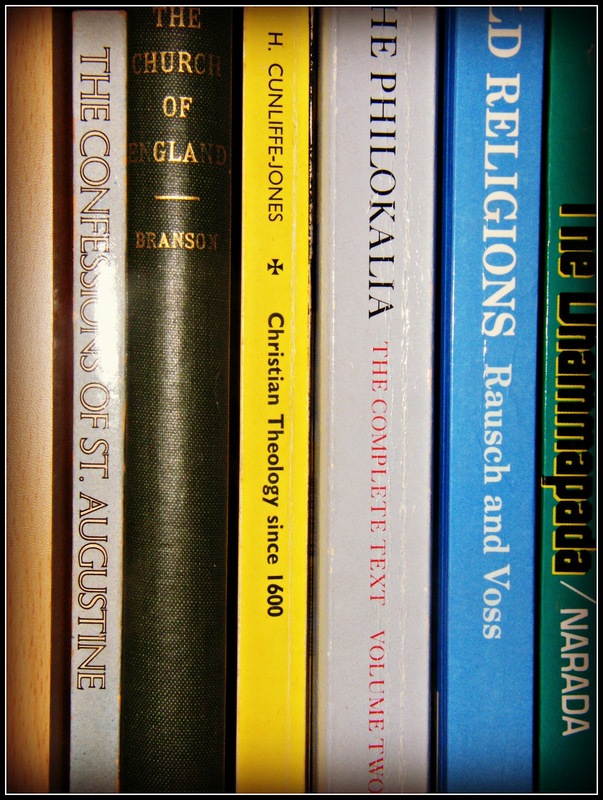 I found Christian Theology since 1600 in a remainder bin at G. David's bookshop in Cambridge. 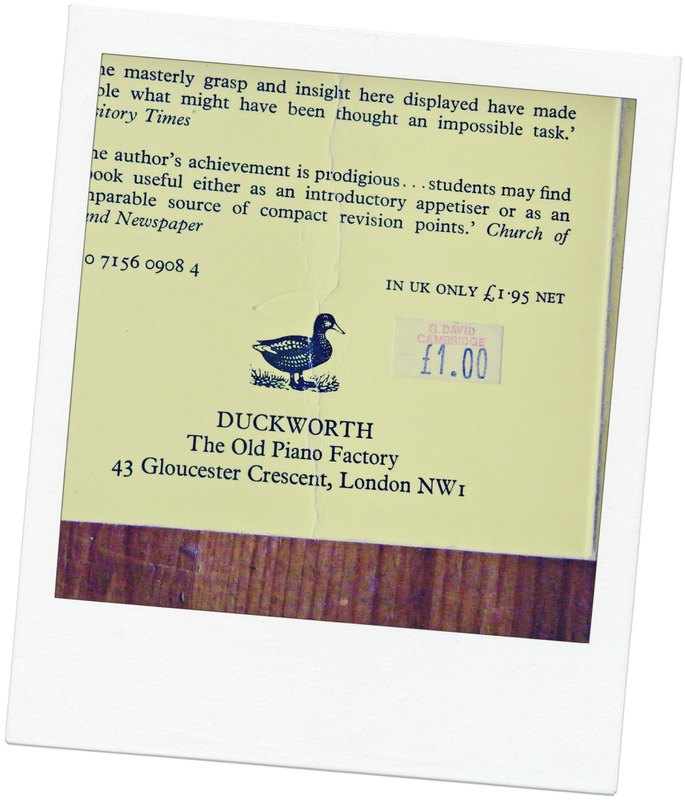 It cost me just one pound ~ which I judged to be extremely good value (considering it covered four centuries!). It was the last day of a vacation school that I had been attending. It had ended in the early afternoon. The sun was out and I had wandered along the Backs beside the river Cam and I was loathe to leave, so, for an hour or two, I roamed the shadowed back streets of Cambridge, feeling its pulse and drinking in the atmosphere. Nearby the bookshop was a dark, studenty-type coffee bar. For an hour I sat among the thrill of new worlds in the thick aroma of coffee and voices. I read the first paragraph over and over again. I was entering my forties and my world was changing. I had enrolled on a four day 'vacation school' that was run by a Social Reform think-tank that was trying to establish (what they called) an 'economic system built upon biblical values.' 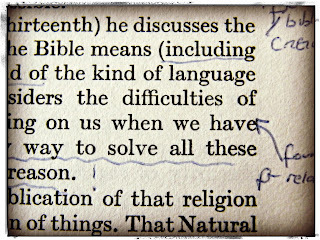 I had completed their correspondence course and here was my first taste of proper theological thought in a real-life college setting. I could not believe that I was there. Driving in each day from my sister's I could barely contain my excitement. I was also hopelessly out of my depth. Everyone was desperately clever. They were mostly Oxbridge graduates who had studied law or economics. They used words that I had never heard before and confidently talked about books I had never seen. I barely spoke a word (even during the breaks). The few comments I did offer still make me cringe. At the end we had an 'exam.' Graciously, those running the school omitted disclosing to me my mark - although one of my assignments did come back with an exasperated remark about my appalling spelling. But there was a fire in me to learn and I was thrilled to have been there. 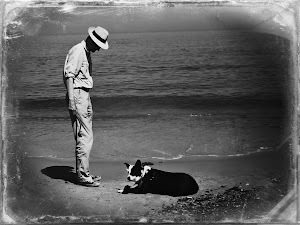 I was a puppy dog, who smiled and said 'hello' to everyone, and I walked the quads and corridors as tall as Nelson. I laughed too loudly and I wrote everything down in a sprawling, tangled, web of notes. Everything in me ached to study; to understand what drove these people who grappled with the big issues of life, to see and to touch the stars that soared in their minds. 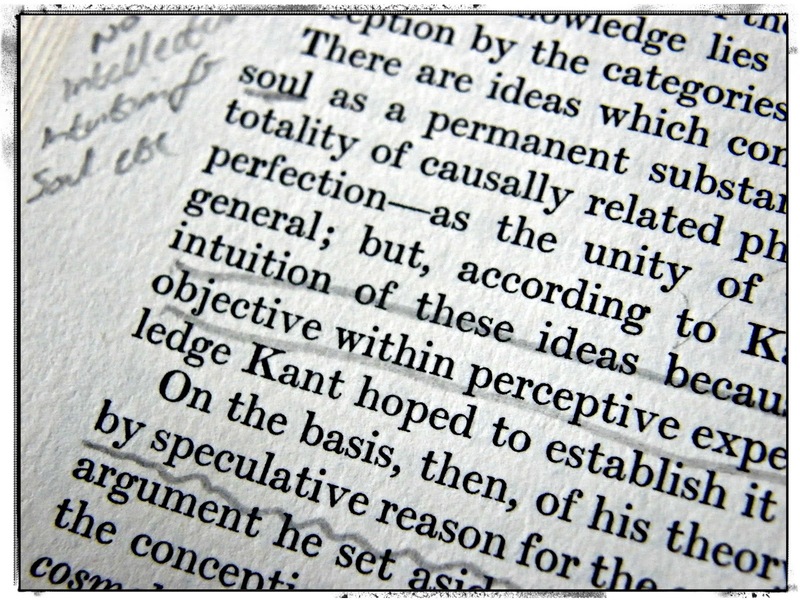 It was a dream that, at times, almost ripped me apart - for I knew (as this course yet again amply demonstrated) that intellectually I was below average. I had to keep a dictionary beside me as I read which made reading a slow, slooow and laborious work. I had no stomach for argument and I could be swayed by almost any point of view! Nevertheless I still longed to study. This was really my first proper theology book. Previously I owned a number of fairly serious books that looked at fairly serious subjects in a fairly serious manner, but all of them were from (what academics call) a 'committed' position. 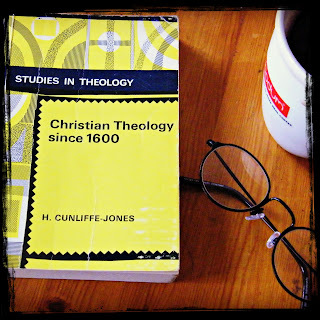 This was a book written dispassionately for the study of theology, rather than an apologetic for a particular theological position - although glancing through it again, one can detect some of Mr Cunliffe-Jones' sympathies. A year later I began to dare to think about the possibility of studying in a college - nothing fancy just an evening class; I did not have enough qualifications to go to university. 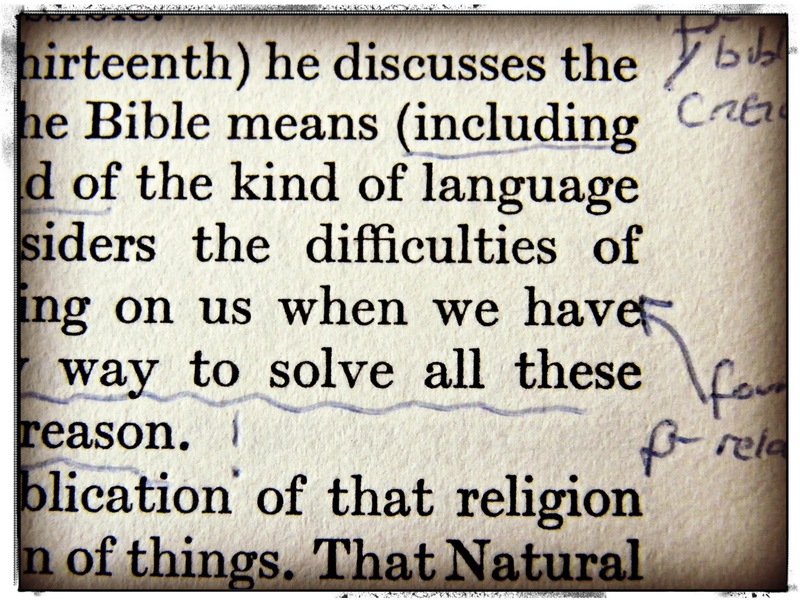 I can remember standing in the middle of the library of a local bible college (it was their open day), breathing in that heady atmosphere of words and dust and sun-cracked, old bindings. The light fell through the window onto shelves of uniformly bound volumes. Their spines carried names I faintly recognised and many more that I had never encountered. I longed to open my arms and sink into each shelf assimilating the mass of words and thoughts they contained. A few of the lecturers were on hand to talk to prospective students. I stood in the shadows, mute, unable to say a word. In hind sight it would not have been the place for me. I needed somewhere that taught me the skills to ask the questions that burned within me but which I could not articulate. I did not need to be presented with answers that I already knew in neatly-tied dogma but in which I no longer had confidence. Nevertheless, when I got home I cried; that ache hurt so much and the possibility of study seemed so remote. H. Cunliffe-Jones (and a few others) got me through those bitter-sweet days of my growing. 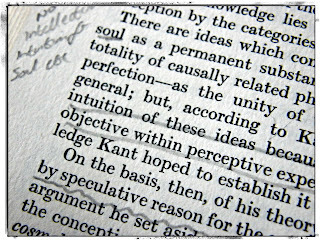 Slowly I read each page (though understanding little), spidering the margins with notes, underlining passages I thought might be important. I don't think I ever finished it, but that does not matter to me, neither does it diminish my love for Mr Cunliffe-Jones. His "modest attempt towards establishing a trust-worthy perspective of the recent centuries that lie behind us" gave me the first fingerholds in a mountain that I was to later climb. 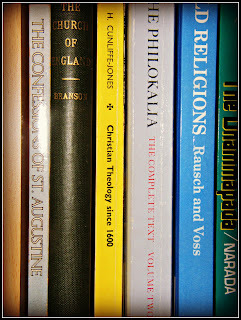 In the watery sun of that summer Cambridge afternoon, feeling self-conscious and out of place (yet with heart racing), I first opened his book and slowly read, "[t]ransitions to the modern world may be found in many places, for example in the disjunction yet close interweaving between faith and reason in the thought of Thomas Aquinas..." With that, I began my transition from one world to another. After the fireworks the rains came. Long silvered spears that pierced the darkness, silently slicing the once electric, tumultuous air. Slantwise and lazy, it fell upon the ground and the cardboard cones that exploded in fountains of colour and light with a hundred gasps of spellbound breath. The leaves, slippery and wet, drifted upon the same wind that carried fire into the heavens. 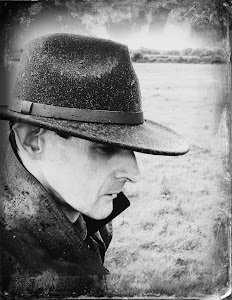 The wire of sparklers, as thin as dowsing rods and just as magical, pin sharp and needle hot, lay unseen upon mud and grass (where beetles forage). 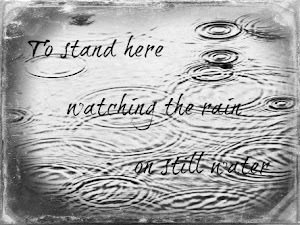 And the rains came for them too. 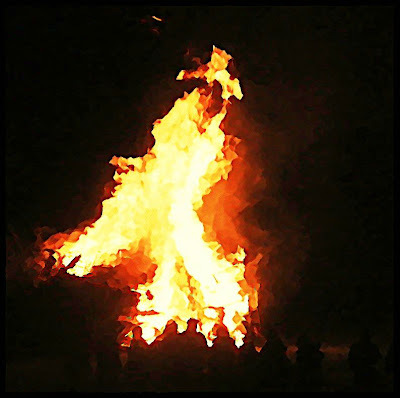 The bonfire, built by men with serious faces and the light hearts of their youth, flamed with the roaring passion of a warrior in the wintering dark. Earlier a ring of silhouettes had gathered round it to stare into its strange dance. Its tattoo beating upon the more primal hearts. 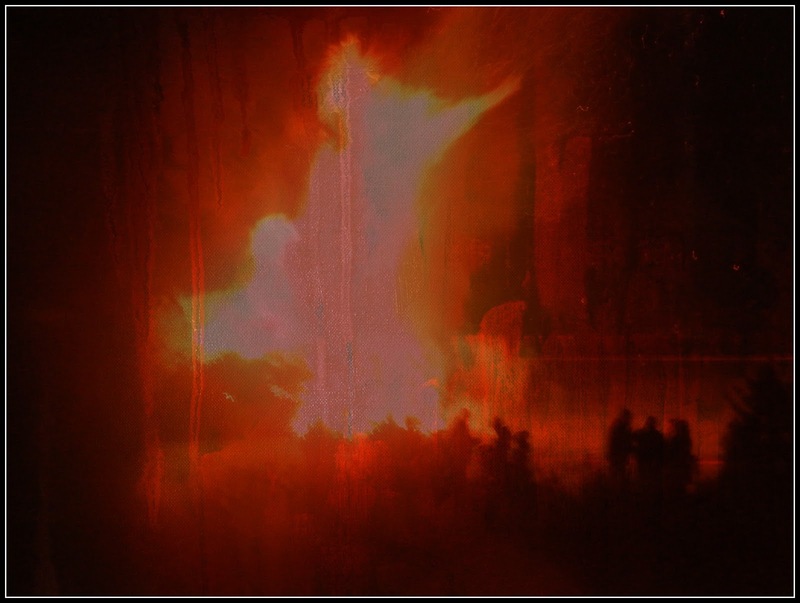 Fire attracts all, but its power seems to be the lightest upon the children. Excited they run and shout to each other above the roar. It is the elderly who feel its power the greatest. The ruddy flicker deepening the lines of aged faces -contours of grief and laughter and unspent anxieties. They stand, silently staring into the deep furnace; lost to the cold and the ticking of eternity, their eyes once more ageless as they yield to a magic that once stirred their souls. Stand here and watch those who are entering maturity, see how they will suddenly break away from the jostling throng, as if something has suddenly caught their eye; their eyes drawn to the alchemy of flame dancing under the bowl of night. For a short while they are stilled, silent, feeling the beat of the heat upon their faces. Watch their eyes, the way they stand, poised on adulthood. They see how this light discloses the deeper, truer, wilder beauty of the little group of girls alongside. They are learning to listen to this strange song of fire that is sirening their souls. For a while they stand mute and enchanted, then the noise of childhood pulls them back. But next year, they'll be here. Standing perhaps a little longer... looking a little deeper... losing themselves a little further in the great hymn of smoke and spark and flame. For evermore, each fire they encounter, in hearth or garden, they'll seek out that ancient song that called to them in their youth: The older they get, the stronger it will be. But the rains came even for this; hissing and soughing, as the wood and hedgerows once more come alive. And now, the embers glow and wink like dragons' eyes and the ash lies thick and black upon the grass. 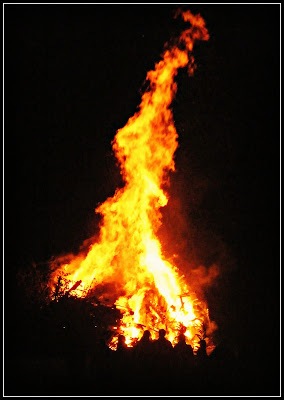 It will remain there for many months to come - this circle of night where once the darkness blazed with light and we stood together to catch, once more, the songs of fire. And then the rain came. The glorious festival of water and light... and with it... the breathing silence of the land, once more, embracing the night.